Everyone wants to be part of something and WE want YOU to be a part of our TEAM! 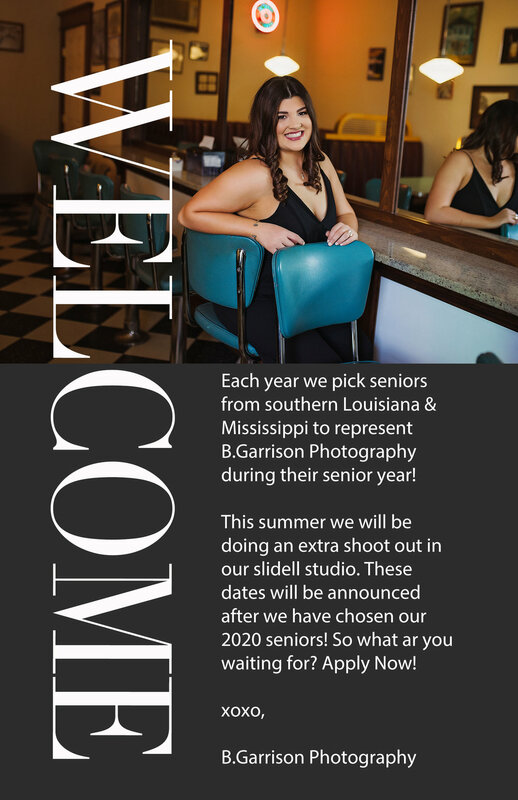 B.Garrison Photography is looking for 2020 seniors who want to be a part of what we do, FULL of LIFE, love to laugh, creative, have a love for fashion, are involved in school and other activities, sports, clubs and are active on social media sites. We want to you to be ready to experience Senior Photography In a BIG way. Our Sessions are Fun-Filled with lots of laughter. You will become like family, get to know Girls from other schools and make some life-long friendships. Application deadline is May 31st, 2019! So… what’s in it for you??? What is the Model Team PRICE and what does it INCLUDE? $300 Print Credit. This credit goes toward any of our prints, albums Etc. For every booked referral you will receive a $25 gift card to your fave store or apply it to prints/products! Whoever gets the most referrals will receive an additional $100 gift card to your fave store in April 2020 after I announce the winner! Model Program fees are as follows! $200 Model Fee (non refundable) is due upon acceptance into the ‘20 model team. The remaining balance due in 4 monthly installments starting July 1st.